A bunch of superhero authors (and a book recommendation site) are having a big sale to promote the genre and reward our readers! And you get to benefit from it. Not only is my Super 99 cents USD, but several others are also on 99 cents or free from May 18 to 20. You can see all the books on sale here (https://genrereader.com/2016/05/18/superhero-fiction-sale/) after 3 am EST. If you’ve already purchased Super, thank you, and I hope you enjoy it! Perhaps another book in the sale will appeal to you? I may do some shopping myself. This is the only price drop I have planned until Human (Arca Book 2) comes out or closer to Christmas. Maybe not even at Christmas. I have stockings to fill, after all. The price break should last until Sunday afternoon or evening (US time zone). Then again, Amazon will do what Amazon will do. Who knows? Super wasn’t meant to be 99 cents until May 18, but Amazon decided to drop the price a bit faster than anticipated. They may drag their feet on increasing the price again. Super Release! Feliz Cinco de Mayo! In case you missed the obnoxious shilling on Twitter, the Facebook post, or the newsletter announcement, today we celebrate the Super release as well as the famous win of Mexican underdogs against overwhelming forces. For those contemplating following me on Twitter, on May 6 I will return to my usual tweet habits. Adrenaline junkie and almost-respectable accountant Zita Garcia wouldn’t know a superhero from some dude in his pajamas. As a result, the second-to-last thing she expected was to wake from a spontaneous coma, quarantined, and with super powers she has to hide from everyone, including her family. Now Zita must master her new abilities while dodging kidnappers, evading government inquiries, and finding her missing brother. The only thing weirder would have been if the blind date preceding the coma had gone well. Super is the first in the Arca superhero urban fantasy series, and as a movie, would be rated “R” for immoderate language, lame sexual innuendo, and comic book violence. It is approximately 110,700 words, which comes out to about 450 pages in a standard paperback book. 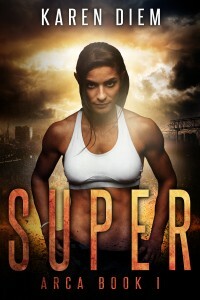 Super is currently available on Amazon , Kobo, iTunes, and Barnes & Noble. Other retailers carrying ebooks may have them too in the next few days. To avoid boring people to tears, I’ve only listed the most popular places. If you’d prefer, you can read the first chapter before purchasing.